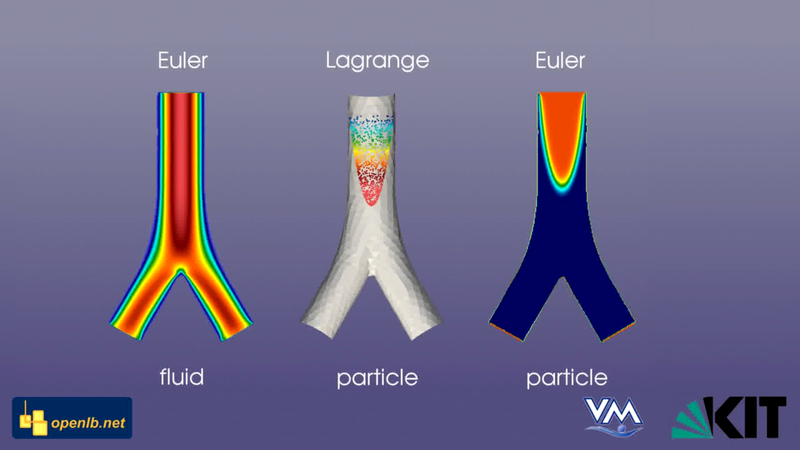 In many medical applications as for example in a human lung the investigation of particle flows is of interest. The numerical simulation is one way to obtain information e.g. about where particles deposit depending on their size. Here, two different multicomponent models are applied to a simplified geometry of a human lung’s bifurcation, Euler-Euler and Euler-Lagrange. Both approaches yield the same results but differ in efficiency regarding the field of application. The source code of this simulation can be found in the open source software OpenLB (www.openlb.net). R. Trunk, T. Henn, W. Dörfler, H. Nirschl and M.J. Krause. Inertial Dilute Particulate Fluid Flow Simulations with an Euler–Euler Lattice Boltzmann Method. Journal of Computational Science, 17(2):438–445, 2016. T. Henn, G. Thäter, W. Dörfler, H. Nirschl and M.J. Krause. Parallel Dilute Particulate Flow Simulations in the Human Nasal Cavity. Computers and Fluids, 124:197-207, 2016. Contributed by Mathias J. Krause.